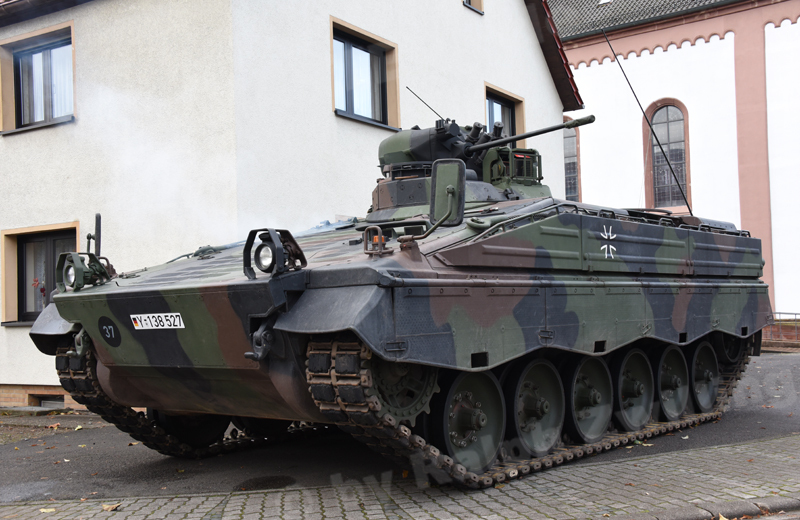 Beginning in 2000, 68 Marder 1A3 AIFVs were modified into Mortar Forward Observer Vehicles by mounting an installation kit. As part of the modification, the mount for the MILAN anti-tank guided missile (ATGM) on the commander’s hatch was replaced by a special mount for the TZG (Turmzielortungsgerät) 90 target location system and related cabling. The TZG 90 can be used mounted on the turret or dismounted from the vehicle. After mortar companies of armoured infantry battalions were disbanded, vehicles were used by field artillery observers from 2003 onwards. 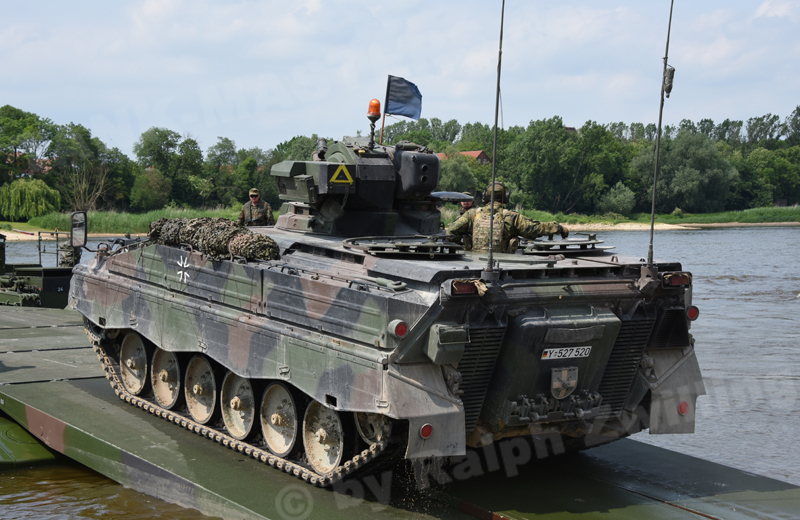 A total of 48 Marder 1A3 Mortar Forward Observer Vehicles were modified to Marder 1A3 Field Artillery Observer Vehicles. From the exterior the vehicles can be distinguished by the TZG 90 mount besides the commander’s hatch and two Comrod VHF 3088 VM antennas on the rear of the hull. 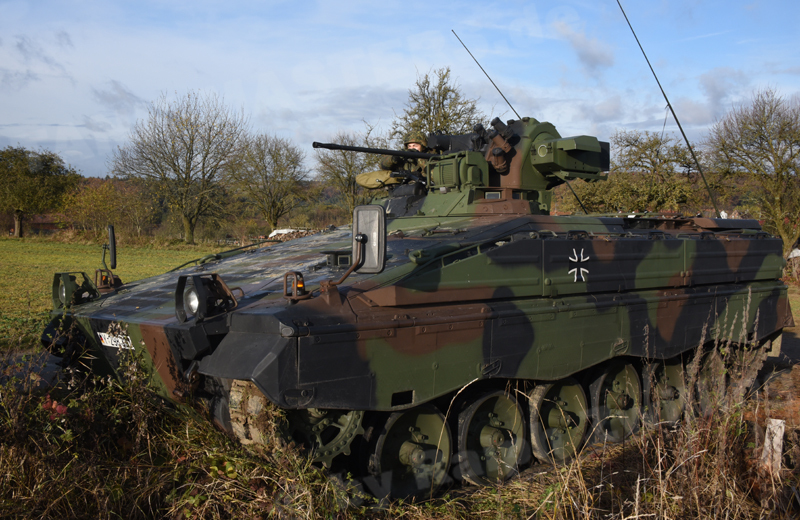 The Marder 1A3 Field Artillery Observer Vehicle features the TZG 90 target location system, a charging adapter, tripod and MRT 86 (Militarisierter Rechner, tragbar) portable military computer. The TZG 90 can be used with or without the MRT 86. By storing the portable military computer on the left side of the vehicle, it can be operated by the artillery forward observer non-commissioned officer who is also the vehicle’s gunner. The change to the radio system mostly consists of a third radio to separate voice and data communication in the fire support radio net. With the help of an antenna coupler, the two-voice radio net (combat troop voice radio net and fire support voice radio net) are connected to one radio antenna. 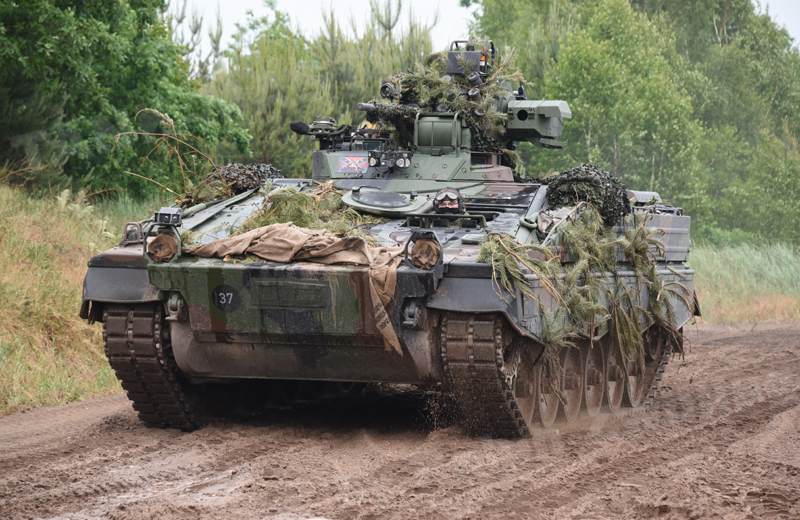 Thereby the Field Artillery Observer Vehicle is able to send and receive radio messages in parallel on all three nets (fire support voice radio net, fire support data radio net and combat troop voice radio net). In order to compensate for distance reduction by using the antenna coupler, the FA 80 radio antennas were replaced by Comrod VHF3088VM antennas. The main armament consists of the MK 20mm Rh 202 automatic cannon, the coaxial 7.62mm x 51 MG3 Maschine Gun and the 76mm smoke grenade discharger system with six launchers.